Skrulls, the ultimate masters of disguise and power. 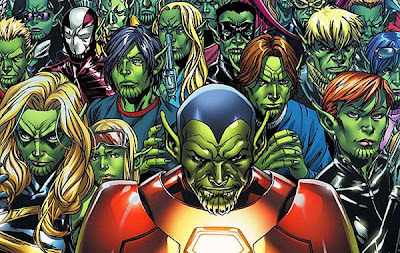 Skrulls have been a long time standing enemy of the Marvel Universe, struggling to keep their empire afloat versus their biggest enemy, the Kree. Skrull really came into light recently due to the events of Secret Invasion, which lead to a huge shift in power in the Marvel Universe, crowing Norman Osborn as the head of S.H.I.E.L.D..